What will it take for Mellie and Olivia to win the battle against Cyrus and Jake? 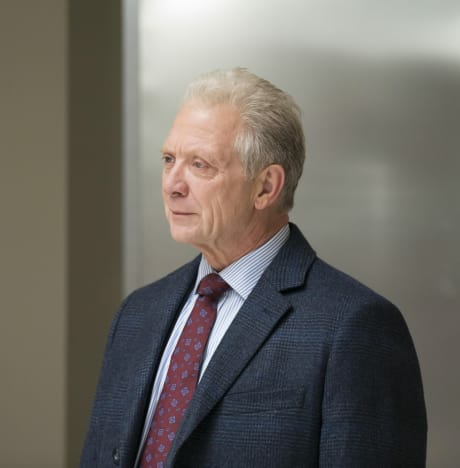 On Scandal Season 7 Episode 16, scheming was at the forefront. We've known who the two villains are for weeks now, and watching Olivia and QPA trying to get the upper hand on the situation was utterly underwhelming. There was no way Olivia was going to pull the trigger when it came down to it. Hell, it's difficult to imagine her even letting that beautiful old bottle of '76 wine being wasted on the man who is trying to orchestrate one of the biggest coups in the history of the Scandal. I'm convinced she would have knocked the glass out of his hand at the last second. It's surprising it didn't wind up across the floor. She was trembling like crazy. 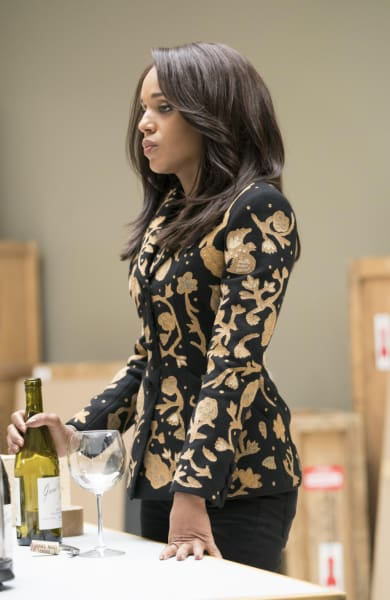 While I appreciated Olivia talking a big game, and even standing behind a chair for good measure, it would have been laughable if she even picked up the chair and threw it all the way back to Scandal Season 5 and "handled" Cyrus. Olivia: I do not kill. Not anymore. Mellie: 418,000 Americans died in World War II. Heroes. There is such a thing as a just war. And we are in the middle of one. Everything between Cyrus and Olivia was horrible, dragged out nonsense until Jake stepped in and revealed that she and Mellie leave all of the stuff to get done to the men. While that may sometimes be the case, they have each done their fair share of wicked things over the years that would render that argument useless. Maybe there's a part of Jake that did not want Olivia to murder Cyrus because then he would be back at square one in his quest to get power. It's all about power with these characters, and it's pretty sad. Olivia let the power go to her head the first time she was working with Mellie, but it looks like this time she's going to be ready to fight all of the wars coming her way without resorting to silly old plots, and strutting around the White House like she owns it. 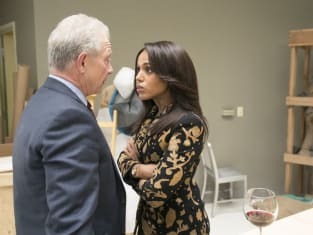 The big purpose of "People Like Me" was to reiterate to viewers that Mellie and Olivia do not resort to murdering people to get what they want, but in Olivia's case, it seems like the powers that be have forgotten half of the stunts she's pulled over the years. I liked that Fitz managed to talk some sense into Mellie because there was no way she would have been able to forgive herself for resorting to the murder of Cyrus. I am the commander in chief of the Armed Forces. I kill every day with drones in far-off villages with the choices I make about how many troops to send to keep the peace, which countries get aid from my government. People die on my watch every day. All of them more innocent than Cyrus Rutherford Beene. Her power play when she knew the cameras were on her in the oval was electric. She knew how to hit Jake where it hurt, and that's why she gave him a verbal beatdown ... without him even opening his mouth. Jake got so mad that people were underestimating him that he even killed his wife, Vanessa. Can I just make it abundantly clear that there was no twist in that kill? What used to be a genuinely shocking TV series with twists that would make us gasp for almost a week until the next one has devolved into a mere laughing stock. Thankfully, there are two episodes of this silliness left, and my one true hope is that we get something that resembles a decent farewell for the fans who have stuck with this show since the beginning. That said, I did like that Huck was on tap to let Olivia know that he did not want to lose her again. Watching him squirm at the very prospect of Olivia killing again made for a good old moral dilemma. Related: Scandal Ending After Season 7! For that reason, I could have gotten on board with Olivia taking out Cyrus in a gruesome manner. It would have told the rest of the team there was no point in saving her. Oh, and forgive me if I don't care about that steamy encounter between Fitz and Olivia because the back and forth over the years has been far too much. 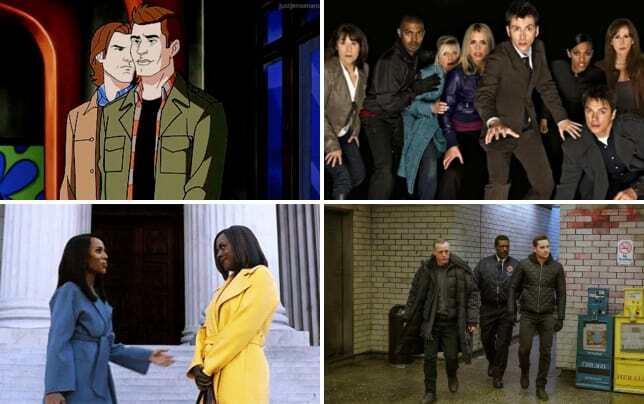 There are times TV characters finally get it together, and it makes you feel all warm inside because the character is moving on to the next chapter. But we've witnessed that same scenario far too many times with Scandal, and it's ridiculous to expect us to get on board with it again. Mellie's address to the media was excellent. Olivia coached her well for what seemed like one of her biggest challenges yet. It's hard to believe that Abby has not hacked yet, but at least Quinn managed to coach her through it. Though Quinn would have probably been faster doing it herself. It's not like Charlie's life was at stake or anything. Cyrus' assistant was clearly trying to make sure she was going to be part of his administration if Cyrus became the man in charge of the United States. I'll leave it over to you, Scandal Fanatics. What are your thoughts on this hour? Were you as disappointed as I was? Who do you want to win the power struggle? 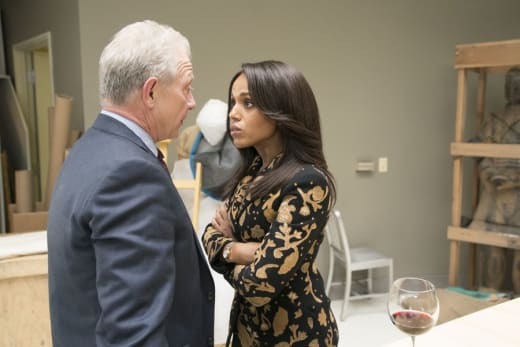 Remember you can watch Scandal online right here via TV Fanatic. Get caught up on all the latest twists and turns now. Scandal continues Thursdays on ABC.